higher quality photos, but they will take up more memory. • Gesture control: Set the device to detect your palm, so you can use it to take self portraits. when taking photos with the front camera. from camera shake while recording a video. 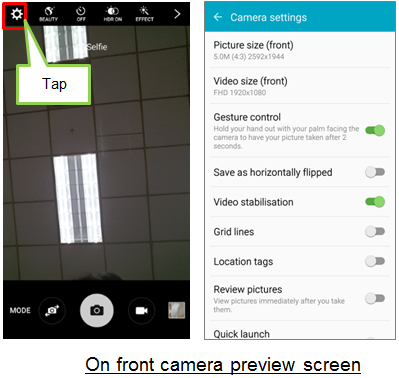 • Quick launch : Set the device to quickly launch the camera by pressing the Home key twice. You can say “Smile”, “Cheese”, “Capture”, or “Shoot” to take a photo. • Volume keys: Set the device to use the Volume key to control the shutter or zoom function.